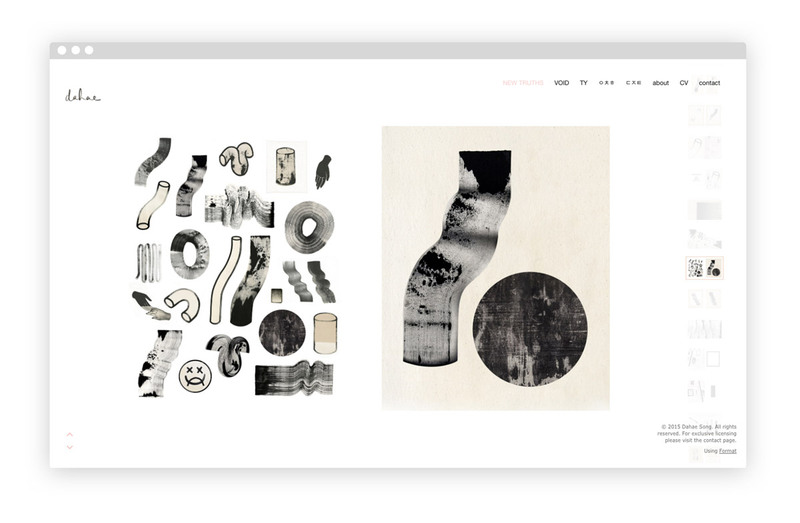 When artists need a website, they use Format. 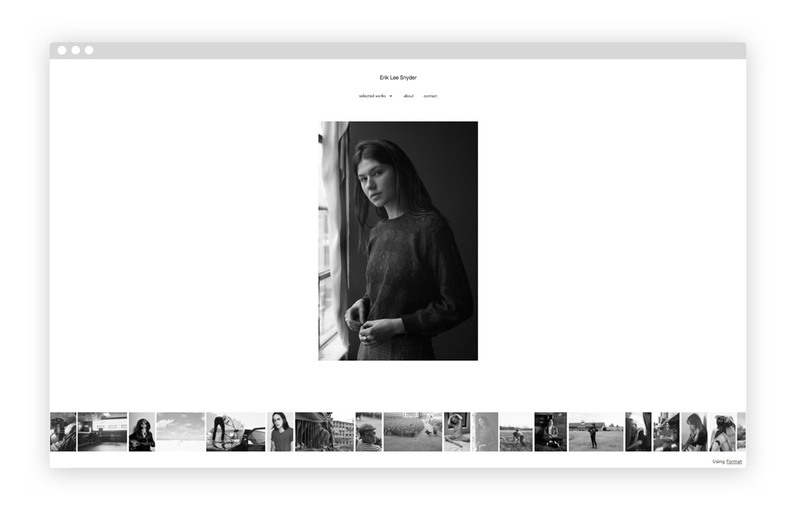 It’s the easiest way to build an online portfolio that looks professional, and you can talk to a real person if you need help. Your work deserves an online portfolio that takes your career to the next level. Don’t let great art suffer from bad web design. 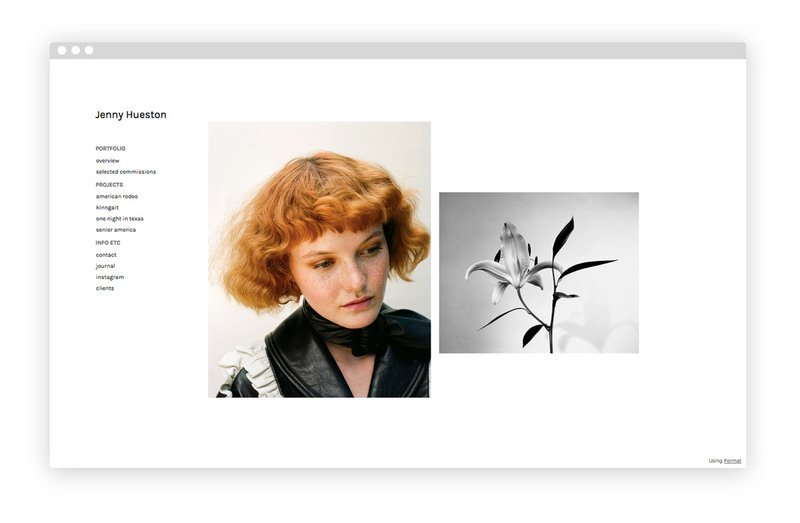 There are hundreds of thousands of artists using Format, including many already featured on Booooooom. 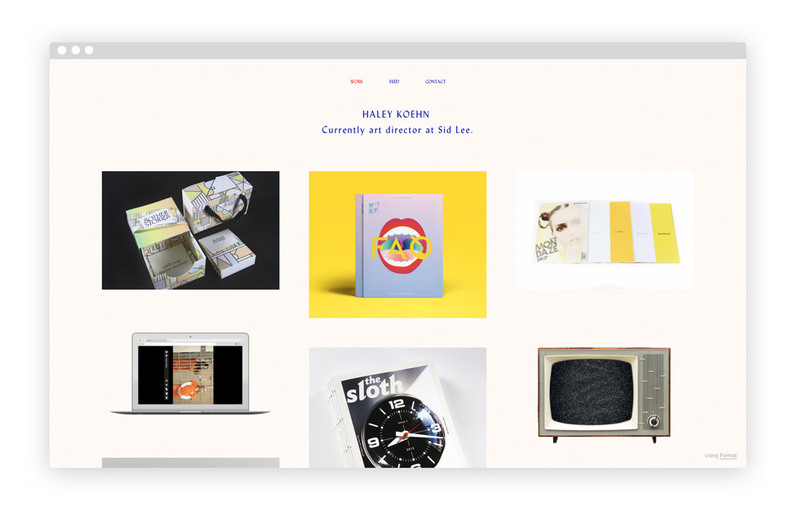 Here’s a selection of 19 artists’ websites for you to check out. Their portfolios are a constant source of inspiration—from layouts to logos. Need an online portfolio? Exclusively for Booooooom readers, you can try Format for three months absolutely free. No credit card required. Click here to start building your portfolio, and have a look at the inspiring sites below. 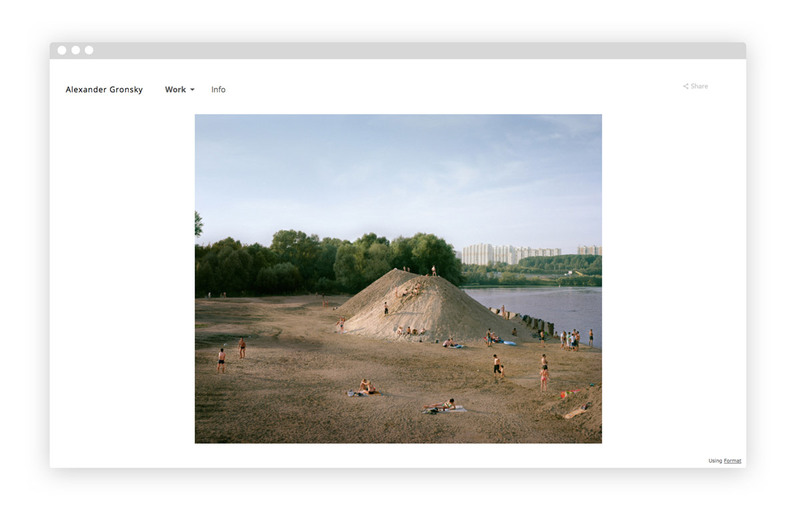 Moscow photographer Alexander Gronsky has documented the changing landscape of Russia in photographs that are sharply focused and classically composed. 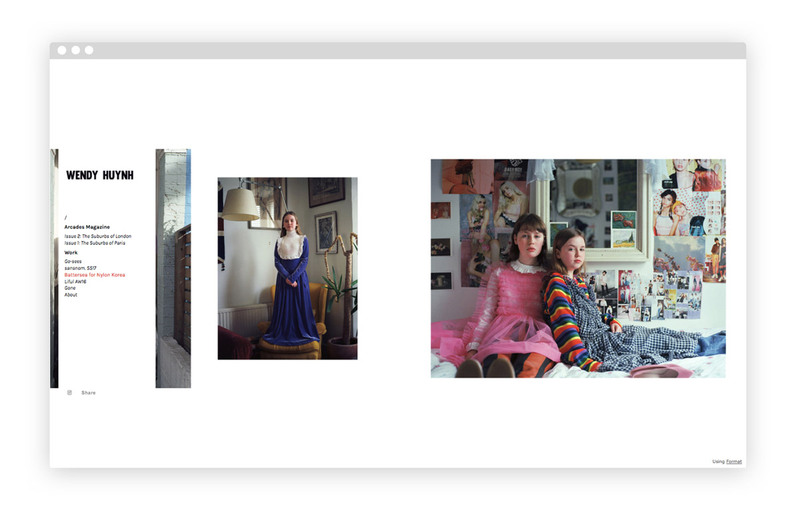 The well-spaced galleries on his portfolio let the viewer really pause and take in each photo. Gronsky’s work has been featured in publications like The New Yorker and The Guardian, and is part of the collection at Amsterdam’s Foam Museum, among other galleries in Europe and Russia. 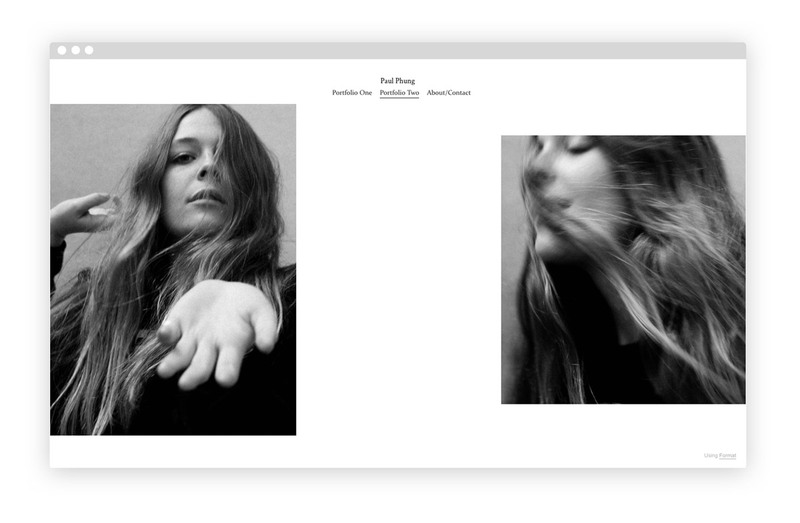 Based in London, photographer Paul Phung has shot for clients like Universal Records and Sony. His photography tends to be minimal, making ample use of light and shadow. 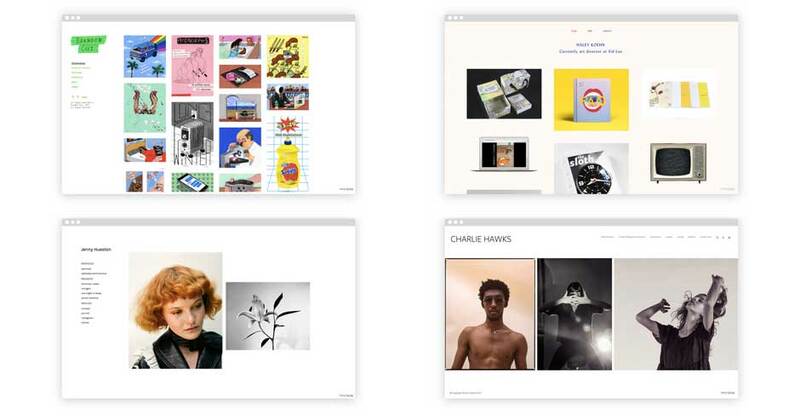 His text-free portfolio is just as spare and starkly modern as his work. Jenny Hueston counts publications like Vogue, Nylon, The New Yorker, and ELLE in her client list. In addition to her creative fashion shoots, the New York-based photographer has documented American culture through inventive series on football and rodeo fans in Texas. Hueston’s images of Americana are both sharply authentic and surreal. Based in Sarasota, Florida, photographer Carson Gilliland is an expert at documenting the odd details of American architecture. Whether shooting a neon sign at night or the chrome hubcaps of a car, Gilliland has an eye for vivid colors and unusual textures that make his photography stand out. The relationship between people and nature is an ongoing fascination for New York photographer Samantha Friend. She often focuses her lens on man-made environments created to resemble the natural world—like parks, zoos, and Disney World. Friend showcases her photos one at a time, without any captions, letting the viewer draw their own conclusions about what’s going on in her surreal images. On his portfolio, photographer David Cortes juxtaposes differently-sized photos for a magazine-style feel. Working between New York and California, Cortes creates portraits that are always personal and unfussy. Whether he’s shooting for brands like Nike, Teva, and Citizens of Humanity, or for publications like Complex, Nylon, Refinery29, Wired, and Cosmopolitan, Cortes’s own casual, authentic style always comes through in his photographs. Sebastiano Arpaia’s photography is enigmatic and carefully composed, creating a real sense of mood even in the most simple images. The New York photographer arranges his work in a way that creates a subtle narrative, with mysterious landscapes juxtaposed next to close-ups of natural textures and unexpected portraits. Arpaia keeps his portfolio as clean as his work, with just a few image galleries offering a look at his style. Brooklyn photographer Charlie Hawks creates zines and curates shows in addition to shooting an enigmatic range of portraits and creative photo projects. 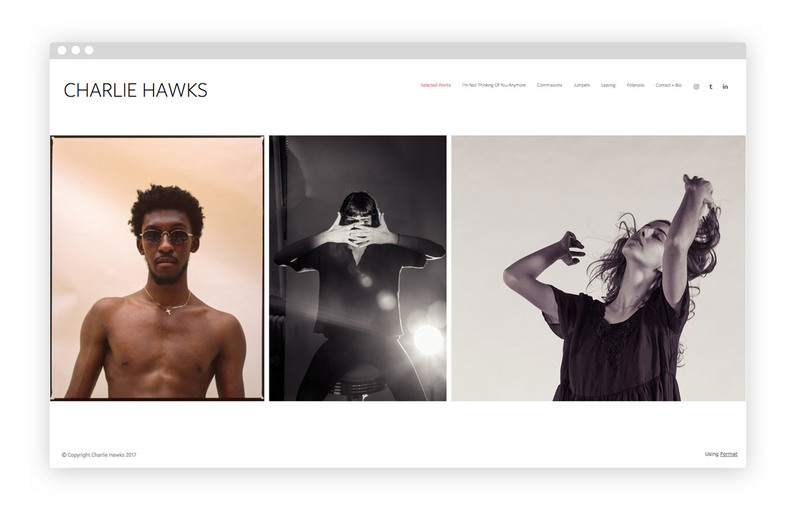 Hawks’s portraits stand out for their memorable sense of total spontaneity. His subjects frequently look away from the lens or pull weird faces, and yet a sense of their personality always comes through in the final photo. Dahae Song is an interdisciplinary artist working with digital media and paint to create abstract, geometry-inspired forms, often in shades of black and grey. The vertically-scrolling gallery on her portfolio is an easy viewing experience which really makes the viewer aware of the texture of each work, as each painting fills up the screen. Photographer Ian Kline is based in Baltimore, Maryland, where he’s working on an BFA and creating stunningly personal photo work. 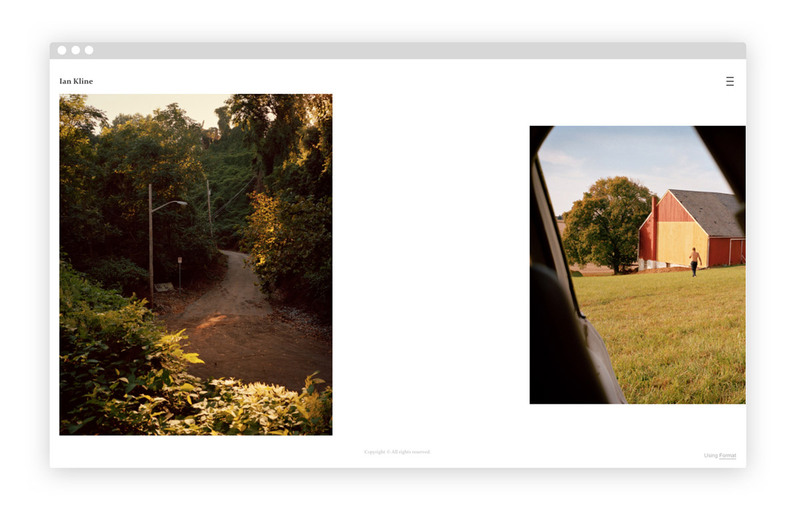 In the two understated series on his portfolio, Blue Fifth and Mary Anne, Drive, Kline builds a subtle narrative that feels real, intimate, and never quite resolved. 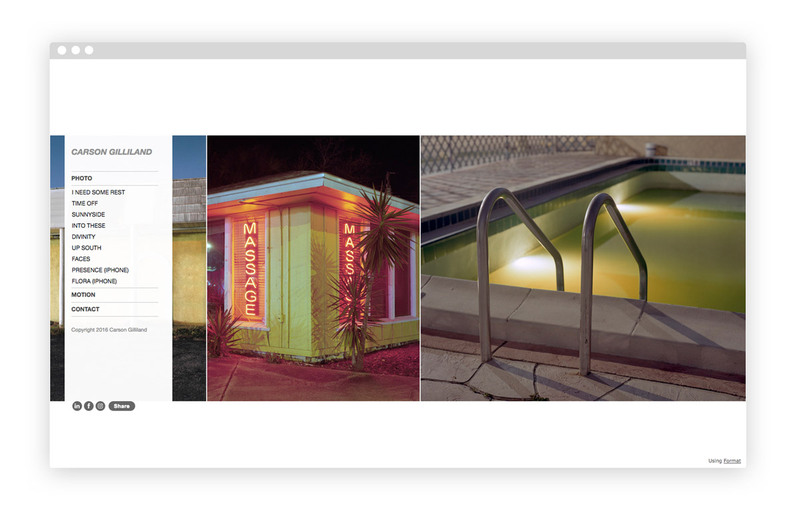 His use of white space between images on his portfolio adds to the feeling of a story being developed over time. Working in black and white, New York photographer Erik Lee Snyder creates portraits that have a timeless feel to them. His portfolio also features a music tour diary that’s full of personality, following artists like Drowner’s Matthew Hitt along the quieter side of life on the road. Snyder showcases his images one at a time and keeps text super small for maximum visual impact. Photographer Sharon Pannen shoots mainly on analog film, often scanning her images with sprocket holes included to preserve that old-fashioned feel. 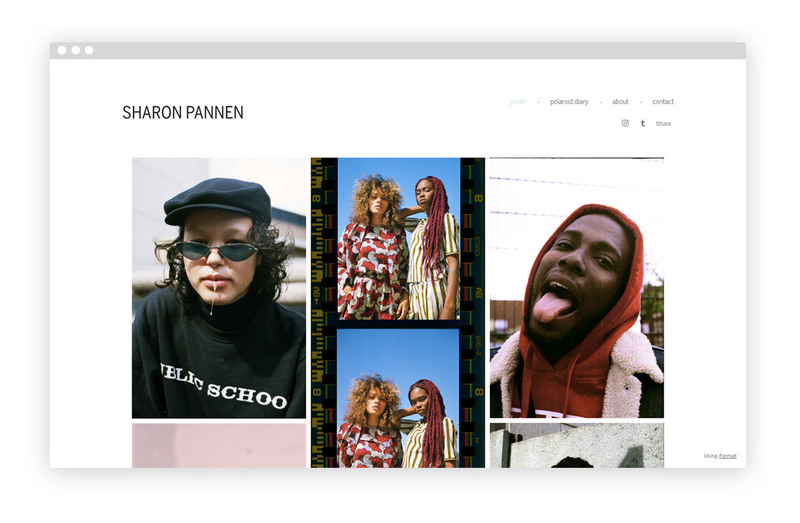 Based in the Netherlands, Pannen focuses on documenting Dutch youth culture. Her portfolio has a distinctly nostalgic collage feel to it, matching the aesthetic of her carefree photos. Illustrator Brandon Celi has developed a unique, artfully naive style which lends itself well to his editorial work for publications like Vice, Lucky Peach, and Bloomberg Businessweek. 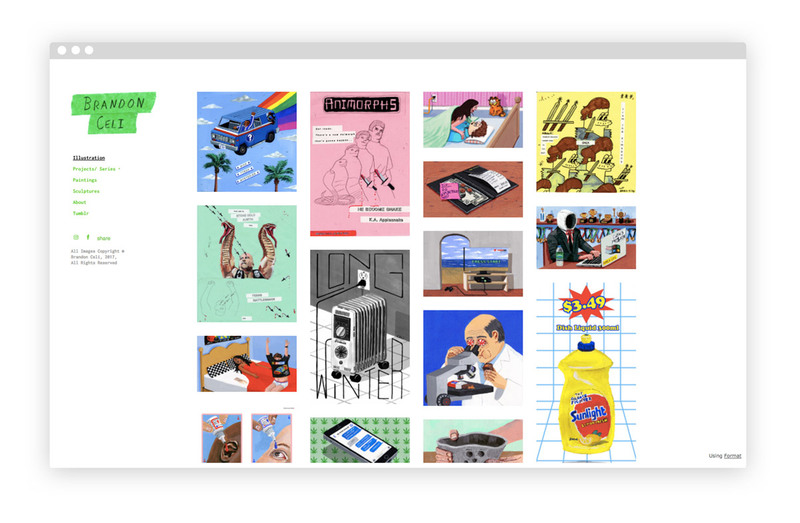 Advertisements, food, and tech all figure prominently (and hilariously) in the Toronto-based artist’s illustrations, which he displays in a colorful grid that gives a speedy overview of his work. Wendy Huynh is a French photographer working in Paris and London. 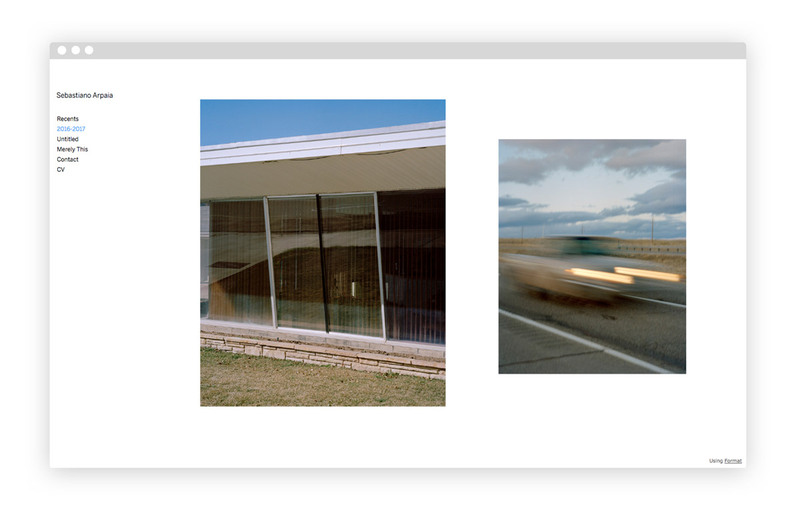 In addition to her photo work, she’s also the mind behind Arcades Magazine, a print publication documenting life in the suburbs through creative photoshoots of suburban architecture and residents. Pictured here is a portrait project she did for Nylon Korea. Photographer Tasya Kudryk shoots fashion, editorial, and portrait work, most recently creating a memorable series on Ukrainian identity for Vogue. Working between Warsaw, Berlin, and Kiev, the Ukrainian photographer always brings an artistic feel to her creative fashion photography. Her grid-based portfolio creates a sense of unity throughout all her different projects. Currently the art director at ad agency Sid Lee, Toronto designer Haley Koehn brings a polished and modern style to her design projects. 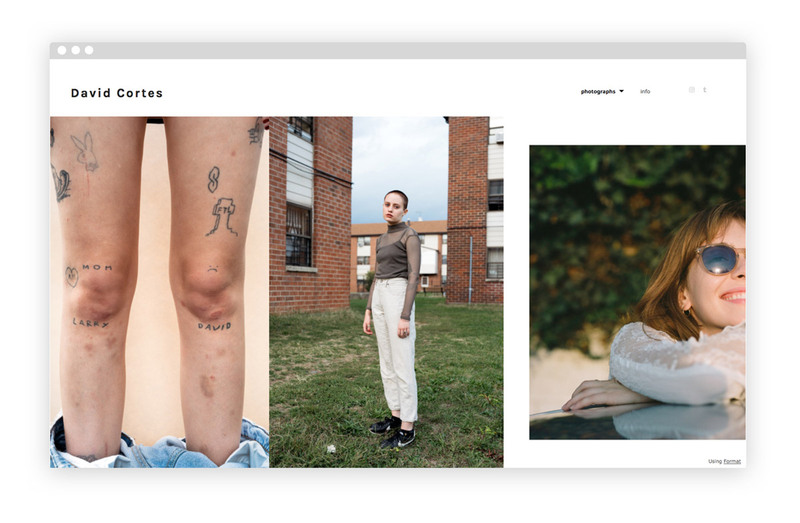 On her online portfolio, a pale pink background, purple font, and GIF previews of her work add instant personality. Artist Curtis Talwst Santiago keeps his portfolio extremely simple, putting the focus firmly on his sculptures and paintings. 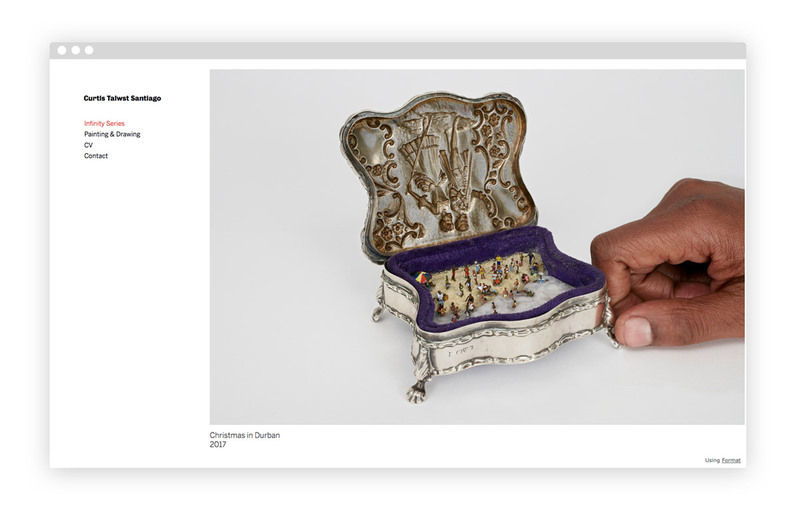 The Toronto artist’s choice to show his work at maximum full-screen size makes sure that all the super intricate details of his tiny sculptures are visible—the artist’s hand also appears frequently in the images, reminding the viewer of their scale. Russian photographer Olesya Asanova’s portfolio homepage is a collage-inspired peek into her work, which includes shoots for Unif, I-D, and Nasty. Her editorial photography is decidedly dreamy, making frequent use of unusual settings and unexpected angles. 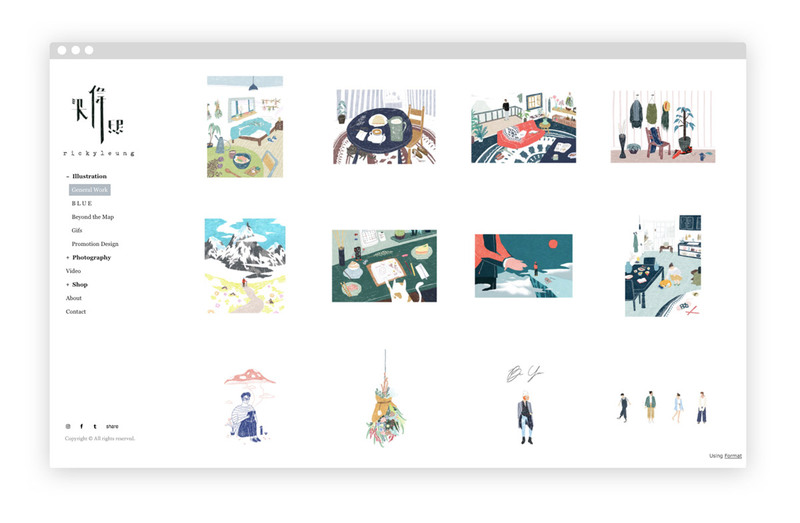 Illustrator Ricky Leung’s GIF-based logo helps make even the sidebar menu of his portfolio site feel like a reflection of his personal style. The Toronto illustrator’s work is playful and fun, with a children’s book kind of feel, and he uses a grid to display lots of it at once for maximum visual impact. To start building your portfolio and to get three free months, sign up here!